Home interior styles tend to follow patterns and trends that can become a bit predictable after a while. 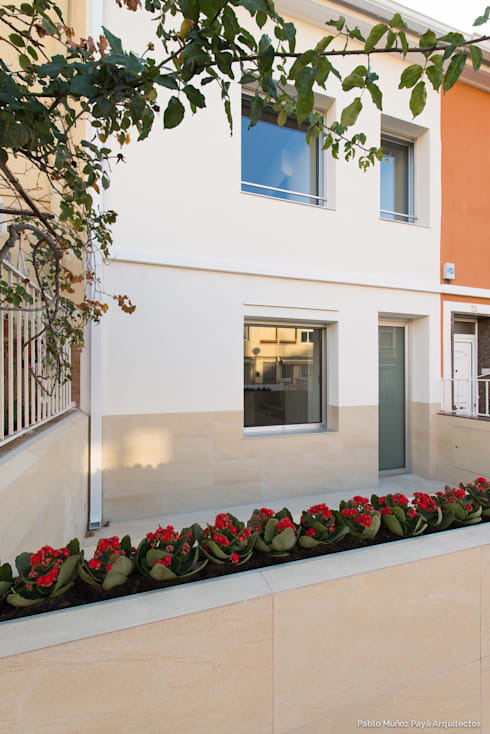 Minimalist, green-friendly homes are an obvious one doing the rounds at the moment. But every now and then, we come across a home that manages to pull off a certain look in a slightly different way. We believe that today's project just might be one of them. 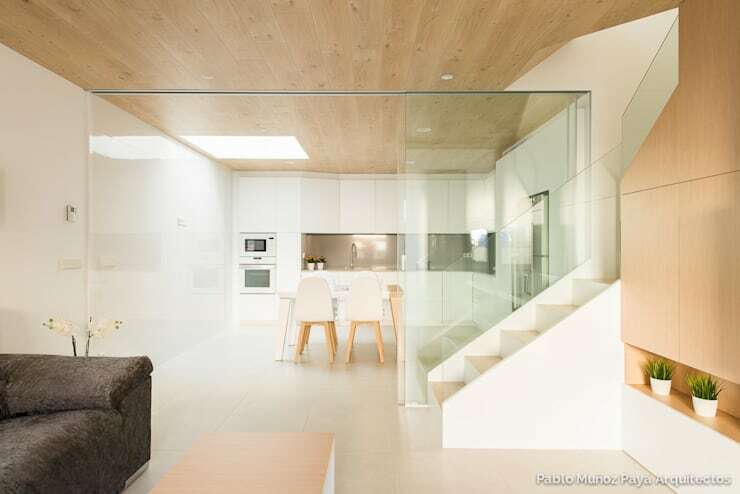 The dwelling is a two-level townhouse with lots of pale wood, glass features and a minimalist aesthetic. But when it all comes together, the effect is quite unique. 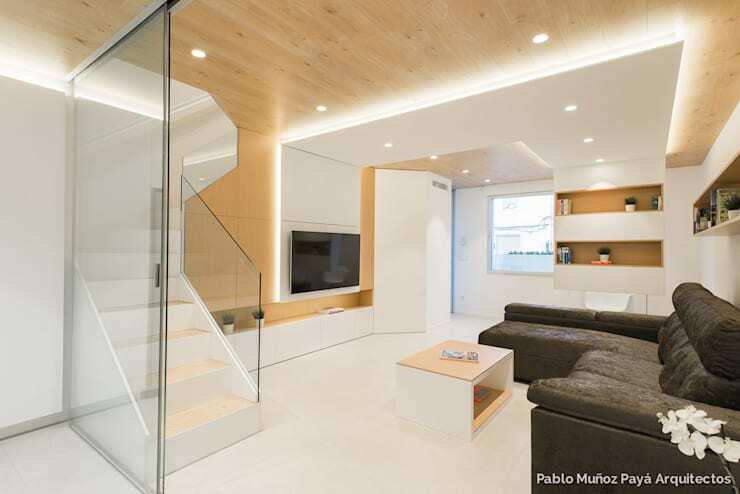 The architects, Pablo Munoz Paya, have provided us with lots of photos. So let's go on an extended visual tour! The interior is surprisingly bright and even resplendent. 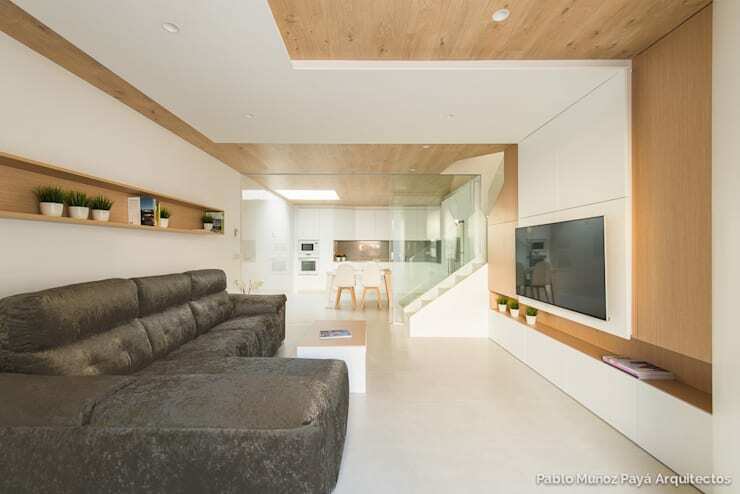 The unusual white floor and white finishes bounce around any light entering the living room. But there is also a fabulously diffuse ceiling light. Note how it runs along the edge of the panel to accentuate the clean lines of the design. From this angle, we get a glimpse of how the living room has been divided from the kitchen with a transparent glass wall. The black sofa provides a dramatic contrast, but otherwise, the living room feels extremely airy and modern. We love the recessed shelf running along the back of the sofa. This kind of combination of pale wood and lots of white is very popular at the moment. But what makes this living room different are the angular lines and total precision of the cabinetry. 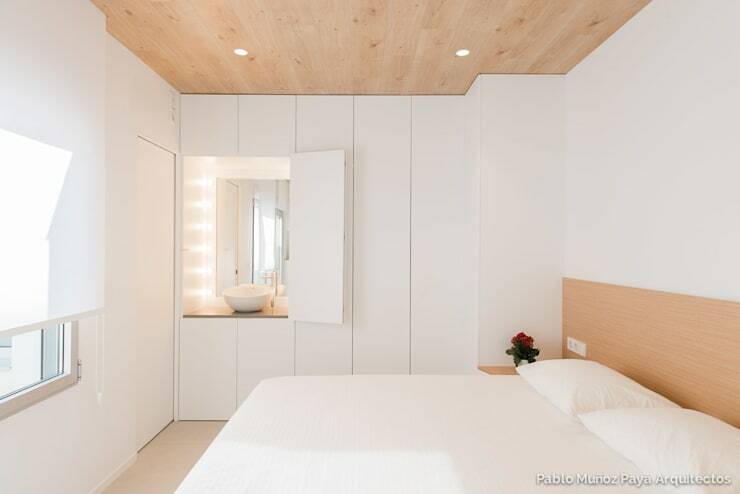 It is also more common to have a white ceiling and wooden floor. Here things have been upturned for a slightly different look. 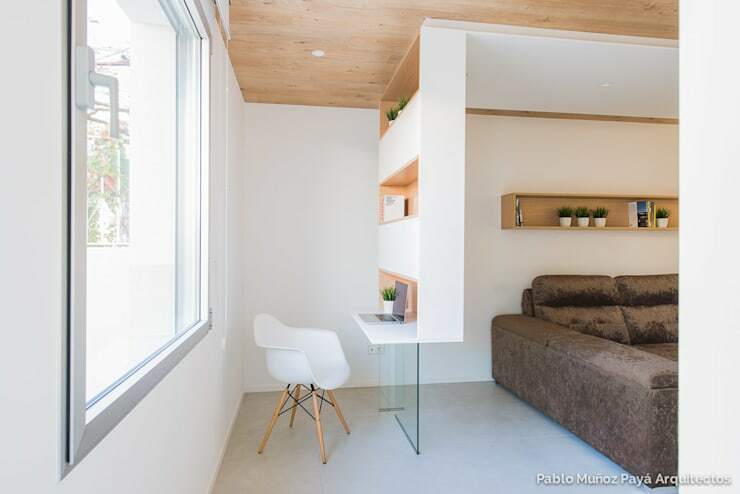 The small home study has a stunning dividing wall. The fine glass bottom half provides a strong contrast in scale, visual weight and proportion to the chunky upper half. Again, it seems that things have been turned upside down. Here it helps raise the eye to the upper half of the room and accentuates that elevating aesthetic. The textures and colours of the materials used in the floor, walls and ceiling play a big part in the pristine aesthetic of the kitchen. There a few visual markers to define the edges of things and this creates a sort of illusory effect in which everything weightless. The white dining table and white kitchen cupboards continue the effect. 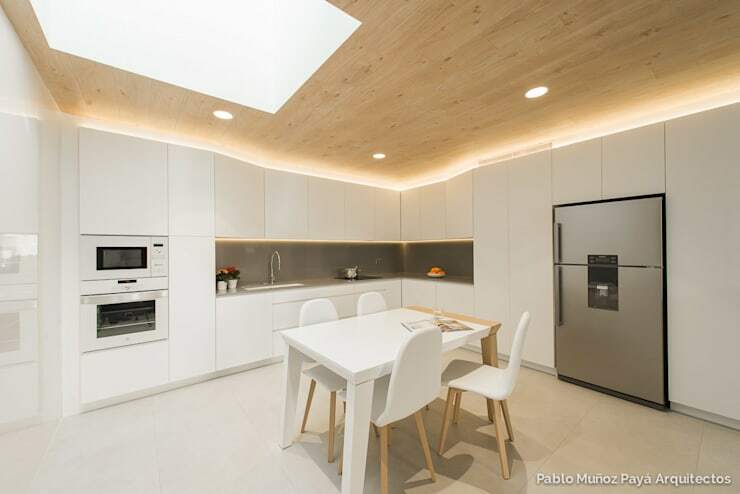 The white minimalist kitchen is windowless. But it does have a large roof light or skylight, together with a strong, diffuse light that runs along the top of the kitchen cupboards. The handleless white kitchen cupboards have a very precise look and there is barely a broken light of sight here. The white bedroom has similar storage cupboards. This isn't a particularly large bedroom, but it does have a fresh, open feel due to the light and minimalist bedroom decor. We definitely feel that the pop out dresser has to be our favourite feature. It's like a little washroom. For more modern minimalist architecture, have a look at A small but stylish monochrome house in the city. What do you like about this modern home?